Kye Stevens celebrated being crowned Shock N Awe amateur welterweight champion and revealed: it’s what you work hard for. The Havant talent picked up an impressive TKO victory over Kieran O’Shea at Portsmouth Guildhall on Saturday. Stevens, who trains at Fratton’s Gym 01, was due to meet Polish charge Mateusz Antoniuk but he was forced to pull out a week beforehand. Irishman O’Shea stepped in at late notice and tried to make things awkward for the former Warblington School pupil in the opening round. 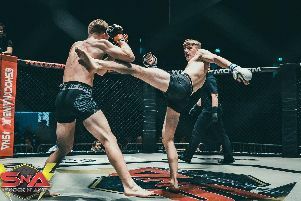 But Stevens found his range in the second and landed a swashbuckling head kick, which caught his opponent flush. 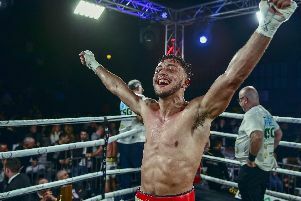 The 20-year-old subsequently finished the bout via ground-and-pound punches, claiming his first title in style. Stevens, who moved his record to 4-1, admitted he didn’t expect his kick to land as clean as it did. And after a six-week training camp, all of the hours in the gym proved worth it. Stevens said: ‘It’s a good feeling to have won the title. It’s what you work hard for. ‘It was a bit of a relief. I said that when I got back to the changing room and Phil (Harris, former UFC fighter) said after any win there’s relief after the training camp that comes before it. ‘The fight was a bit slow in the first round but once I created that bit of distance in the second round then I knew I was comfortable. ‘It was just about breaking away and trying to get away from the clinch. ‘Brian (Adams, Gym 01 head MMA coach) told me in the corner I was playing his game and that’s what he wanted to do. ‘To be honest, before the fight Brian told me this guy is going to try to clinch you and take you down. ‘For the whole six weeks, I had been preparing for a grappler anyway so I felt comfortable against the cage and wasn’t going to get taken down easily. ‘Once the first couple of shots landed and he was against the cage, I thought “I think I’ve got him here”. ‘Then I landed the head kick – I didn’t expect it to land as clean as I did! ‘I was happy with the finish more than anything. Stevens aims for a fifth straight success when he meets Henry Grimble at Victory Fights 4 in Brighton on April 20. And the welterweight’s confidence is constantly growing. ‘My record has been consecutive since losing my first fight just more than a year ago.